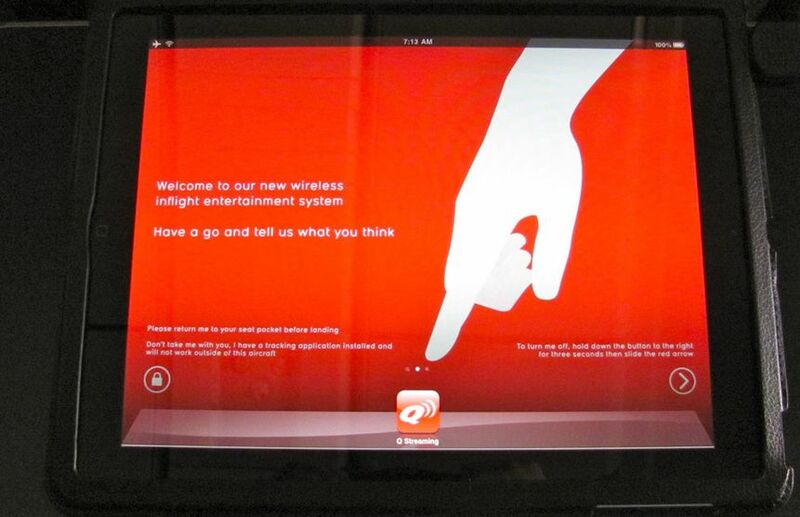 Qantas is running the world’s first trial of the iPad as an in-flight entertainment system with movies and music streamed to each device over Wi-Fi, rather than being stored on the tablet itself. 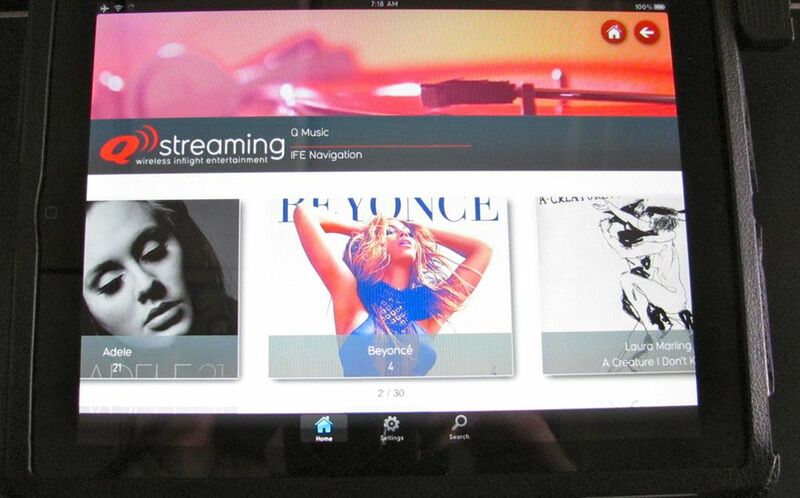 The ‘Q Streaming’ system is built around Lufthansa’s BoardConnect technology, which Virgin Australia and its US sibling Virgin America will roll out later this year – so in more ways than one, this is a sneak peak at the future of in-flight entertainment. Australian Business Traveller took to the skies to try it out. 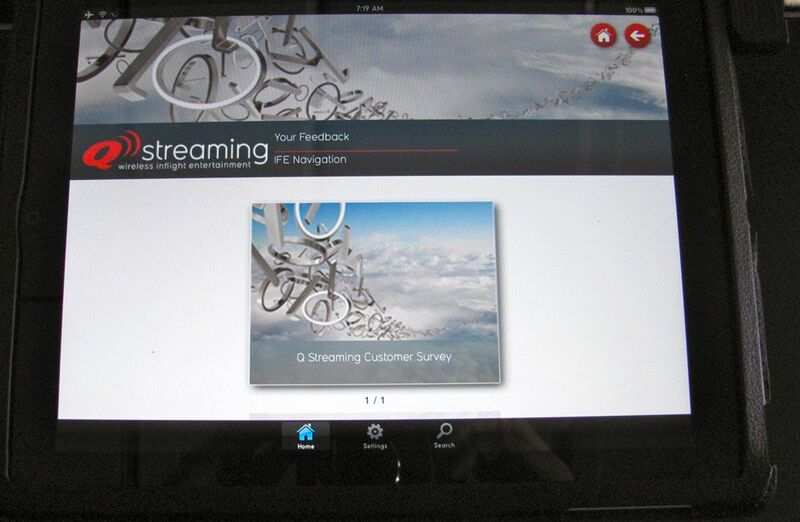 You can sit back and watch our video of Q Streaming live in action (above), or scroll through this article for a closer look at how the in-flight iPad system works (or, you could do both... and why not?). 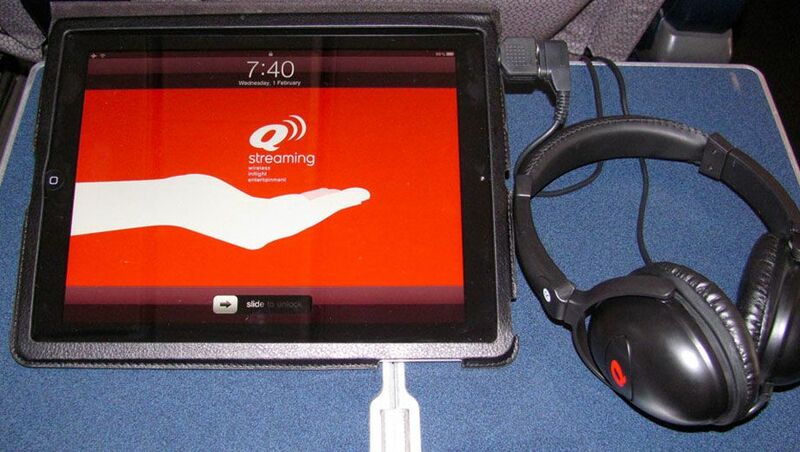 Qantas is running its Q Streaming iPad trial throughout February on a single Boeing 767 which will be scheduled across a variety of routes, from short Sydney-Melbourne-Brisbane runs (what Qantas calls the ‘triangle route’) to the five-hour trek between Australia’s east and west coasts. Qantas chose the Boeing 767 for the pilot iPad system because it lacks individual per-seat video: there’s just a few small screens in the bulkhead and hanging from overhead. If you’re a real aviation geek, the aircraft rego to watch for is VH-OGH, but Qantas isn’t laying out what specific flights it will be on – this is a bit of ‘surprise and delight’ at the gate. 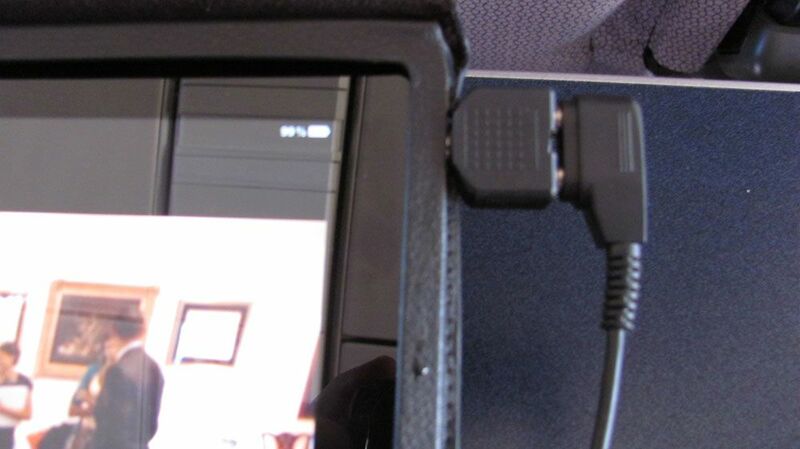 When passengers in both business class and economy board the plane they find an iPad 2 sitting in the seat pocket: screen cleaned, battery charged and ready to go. 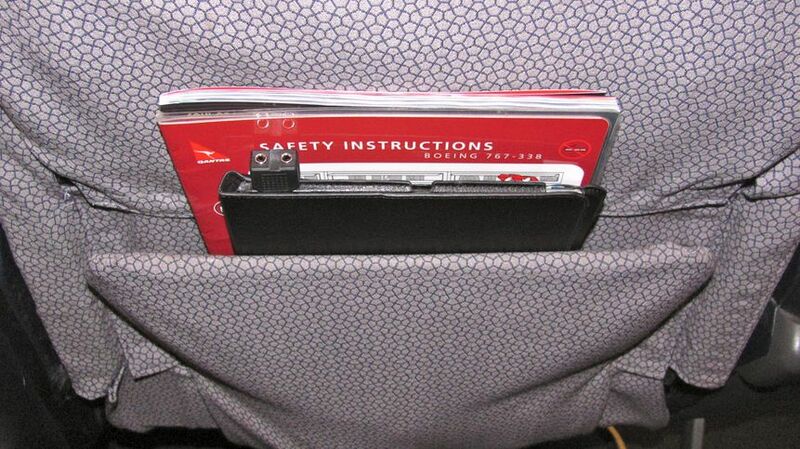 That means one tablet for each of the aircraft’s 254 seats, and there are a dozen spares on hand for each flight. 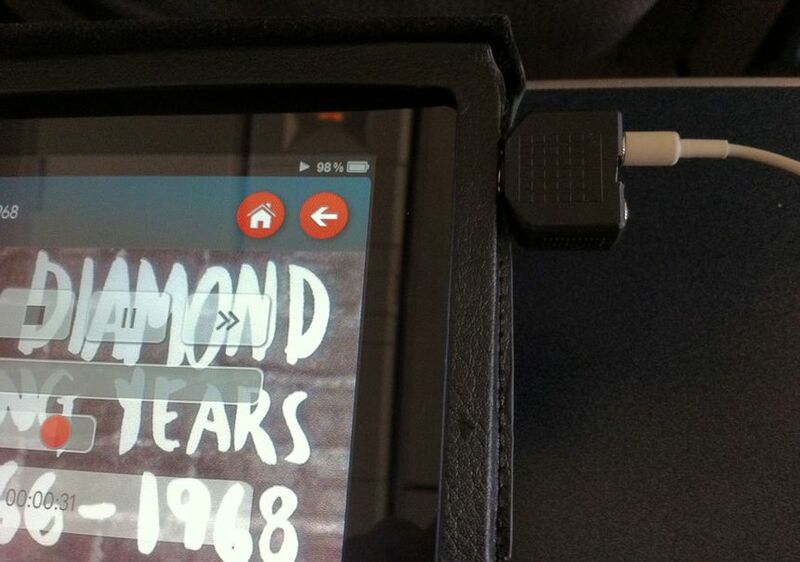 Each iPad is enclosed in a simple case with a headphone socket to convert the iPad’s standard audio jack to a two-pin connector to suit the supplied headphones. 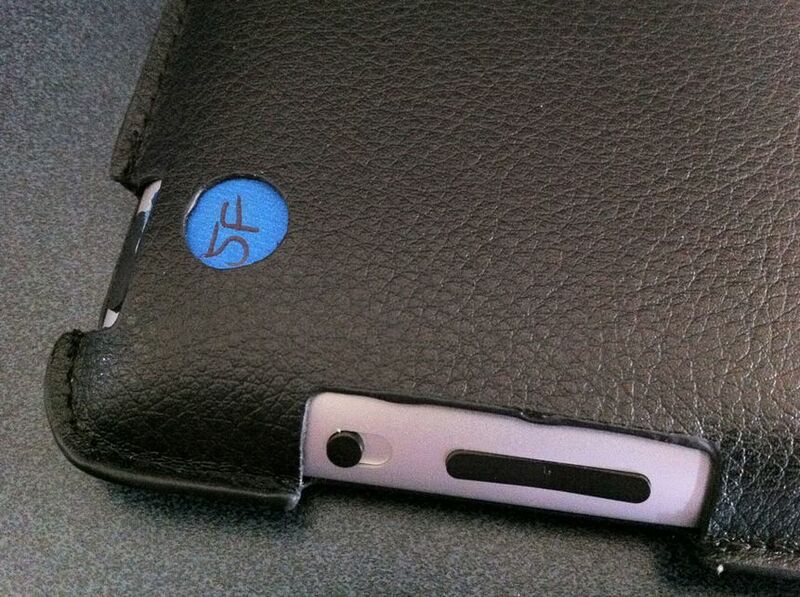 The iPad’s camera is covered with a small sticker bearing the seat number to which the tablet has been ‘allocated’. When switched on, the iPad launches straight into a welcome screen which hides all standard iPad apps and exposes only the Q Streaming app. 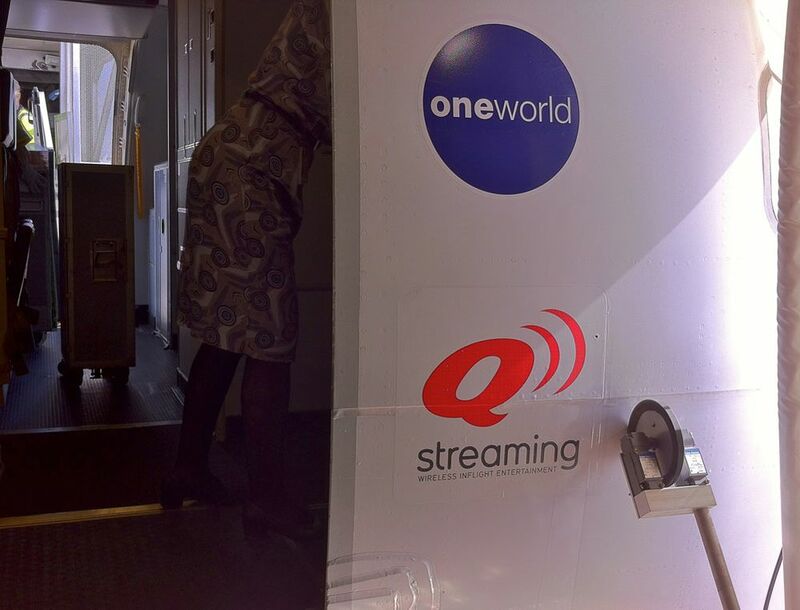 To connect to the 767’s Q Streaming network and content server, enter your seat number. Each iPad connects to one of five wireless access points, fitted in ceiling compartments running down the right side of the cabin. The access points work just like the wireless hotspot in a cafe or hotel, but for the first half of the trial will be password-protected so you can’t log onto them with your own hardware. 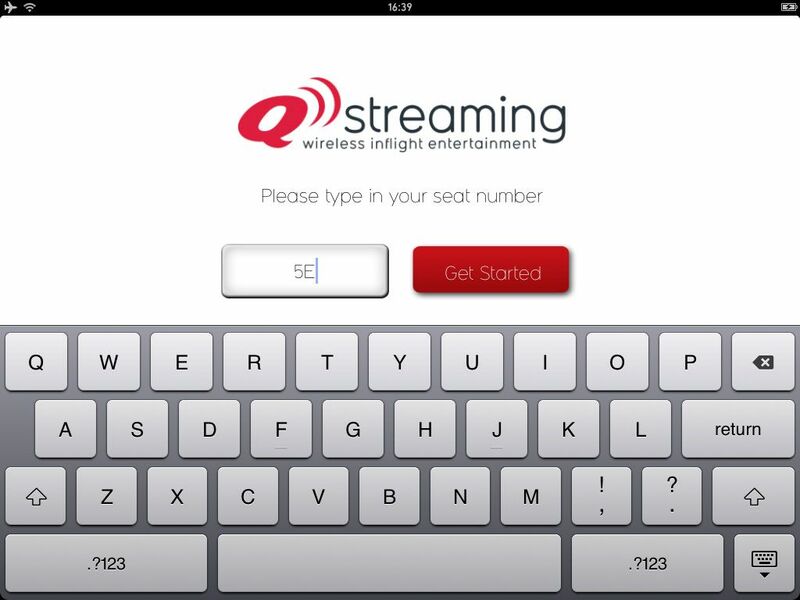 Click here for a closer look behind the scenes of the Q Streaming system, the app and more. The Q Streaming app’s clean and elegant interface is very iPad. Content is divided content into four categories – TV, music, prerecorded radio-style programming plus shows to keep the kids occupied. 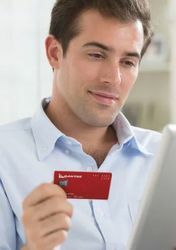 Of course there’s rooms for additional types of content such as movies, ebooks, games and travel information, along with interactive features like in-seat ordering of food, drinks and (on international flights) duty-free shopping. The Feedback tile launches a survey to poll passenger opinion on the system, as well as what types of technology they usually travel with and other content they’d like added in future. Some of the Q Streaming menus run several layers deep: for example, tapping TV reveals programming categories such as documentaries, comedy, drama and travel. Tap any of these and you can see the specific shows on offer. Another tap takes you to a list of available episodes for each TV series. In most cases there’s also a synopsis screen describing the show. It’s all very much what you’d expect on a conventional in-flight entertainment system, but done with simple taps and swipes and delivered right into your hands. Transparent on-screen controls let you pause, forward and rewind video as well as manually ‘scrub’ forwards or backwards to specific points in the programme. This control panel appears when you tap the screen and fades away a few seconds after being used. 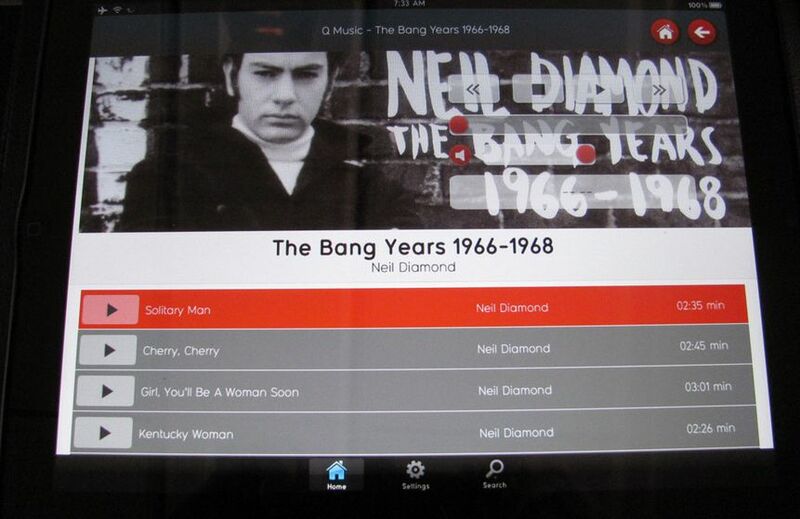 The selection of MP3 music works much the same was TV shows: choose an album, click play, then sit back and listen. Speaking of listening… if you find yourself on the Q Streaming 767, do your ears a favour and plug your standard iPod or iPhone earbuds into the headphone jack (either of the two sockets will do, because both carry stereo). You’ll be rewarded with richer, crisper and punchier sound compared to the Qantas-supplied headphones, even though these are the same ‘noise-reducing’ headphones as seen on trans-Tasman and coast-to-coast flights. If you're sitting in economy, the tricky bit is trying to fit the iPad onto your tray table at the same as any meal or snack. Even thought the case doubles as a back-folding stand it's a very tight fit. Passengers at the pointy end have things a bit easier, as they can fold back the case's cover and slide it into the seat-back pocket so that the iPad hangs down. It's far from an ideal fix but once again, this is trial & testing territory and Qantas is already well aware of this situation. The Q Streaming app also has a search function to scour the available content. 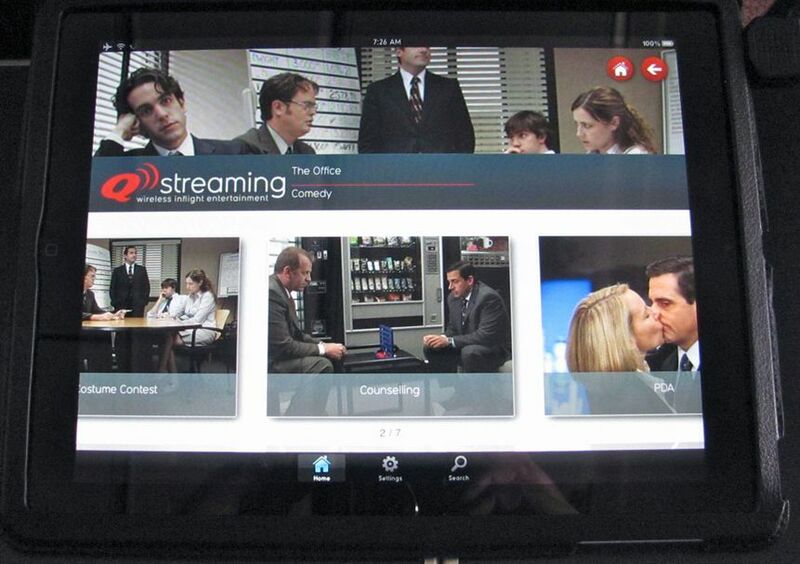 Qantas says it will make the Q Streaming app available for free on Apple’s iTunes store in the middle of February, so that passengers can use their own iPads and iPhones for the final two weeks of the trial. Windows and Mac laptops will also work, provided they’re running Microsoft’s Silverlight software. A Qantas spokesman told Australian Business Traveller that an app for Android tablets and smartphones is also being developed by Lufthansa, however this won’t be completed until after the current trial ends. I got a trial of this last Friday on a Sydney to Cairns flight. My opinion of the software is that it is not written by someone who has developed a high quality iOS app before. It feels similar to the existing Qantas touchscreen software - though running smoother due to the iPad's superior touchscreen. Other than that, the UI is not consistent with other iPad apps. e.g. scrolling across tiles of videos is awkward and not completely smoothly. Also, with the selection of tv episodes, it is not clear what season and what episode each video is, making it different to watch them in sequence. (I watched from left to right but it felt like I was watching them backwards). The case is not flexible enough for a great viewing angle in all seat configurations. David, did you just happen to get on this flight or did you 'shop the plane' somehow, so to speak? AA: this was a flight arranged by Qantas to suit OGH's schedule (and mine). So glad that Qantas have got in there and are trialling this. 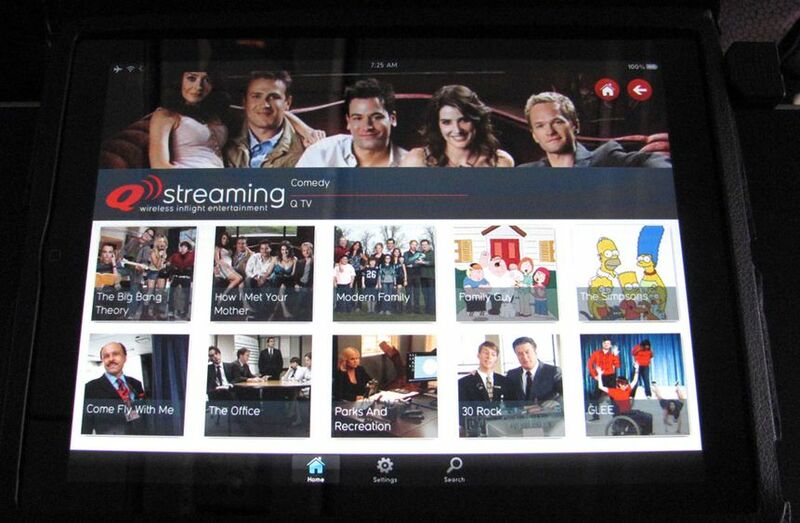 Such a good step forward and when they start streaming to personal iPad's... even better!! This must be better than the AWFUL screens which were difficult to see with bifocals unless you crooked your neck and the inaudible sound... Well done Qantas. Travelling to Sydney next week so fingers crossed.. although must admit my own iPad had a good many hours of entertainment already on board! its good they provide it free without charging you an extra $24 or something just to use an ipad for a couple of hours. I think you were on my QF flight last Wednesday SYD-BNE when you test this (7am depart). This was the first time I came across this. The setup of my iPad wasn't done properly and I had access to the "Settings" menu where I was able to set up my own Email account. I was quite underwhelmed by the iPad. I had a quick look through for a minute and then put it back and got into the newspapers (now there is an idea - push international newspapers to the device - how environmentally friendly!!). In short, great concept, I'm sure AusLT would be interested than AusBT though. Forgot to add, on my return flight that evening BNE-SYD; I went to get an earlier flight and the lady at the J Lounge said "but you're on the plane with the iPads". After my morning experience, I wasn't exactly excited and told her so. She actually had someone who was booked on the next flight who wanted to wait around for a few hours to go on this plane to simply try the iPads out. And YES, he was in the J Lounge. I've heard some bizare aviation buff stories, but staying in a lounge and changing to a flight a few hours later.... come on! She actually had someone who was booked on the next flight who wanted to wait around for a few hours to go on this plane to simply try the iPads out. And YES, he was in the J Lounge. I've heard some bizare aviation buff stories, but staying in a lounge and changing to a flight a few hours later.... come on! LOL! That was me, mate! Qantas had booked me on a regular return flight but when I relaised that OGH was flying back to Sydney after her side-trip to Darwin I figured I'd better catch that so I could grab a bunch more screenshots, as I didn't get all that I wanted on the way up. Would rather have been back in Sydney much earlier but hey, that's the job! Ah - Come to think of it I did see the boarding pass behind the desk with your name on it. Seat 3K? The App would be PressReader.... (a sister to the web-based Press Display). For about $20 a month you can download any newspaper in the world (up to ~10 pushed directly to your device as they become available). The best thing is that the papers are in "newspaper format" and don't require internet connection. Funny we were on the same flight. I also spend 2-3 hours in the lounge working before heading out to some meetings. tried it today, SYD - PER, seat 2A: I was impressed. Of course, this is a new thing, lots of improvement is needed. well done, Qantas! I foresee a legion of regular air travellers with chronic neck problems... ergonomically speaking, it's bad for your neck and eyes to have to constantly look down towards the iPad to watch content. 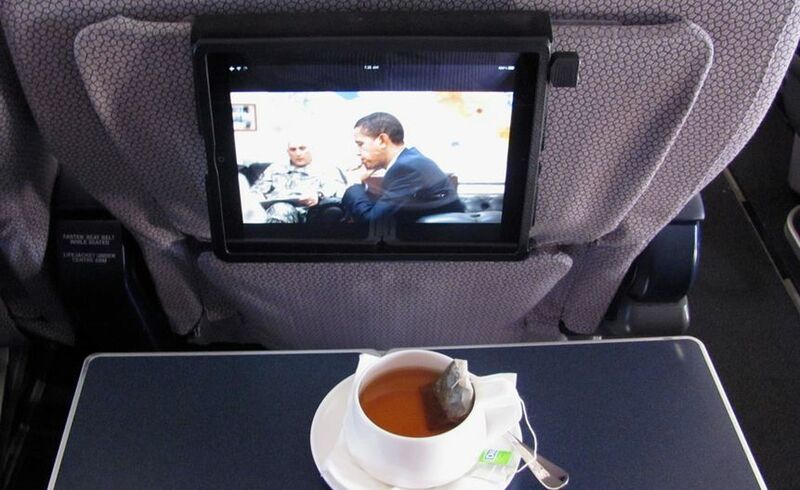 I speak from experience having watched content on my tablet on long-haul international flights. After a while I switch over to the IFE which is at the perfect viewing height, and of course you don't get the crowded tray problem either. Now if they could build the iPad into the headrest then that would be a great improvement but for now I don't really see what the iPad offers over the current touch-screen IFE besides the novelty factor. 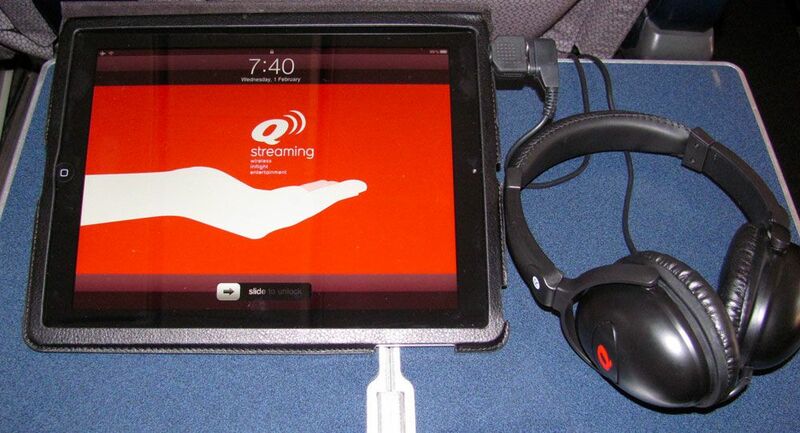 Comment on "Video & review: Qantas' in-flight wireless iPad system in action"